So my best blogging buddy Sarah (of thingssarahloves - her blog is well worth a read) nominated me for the Blogger Interview Tag. It's taken me a while to get around to answering the questions, but it's done, and ready to share with you all. Hopefully you'll have a bit more of an insight into me, and my blog, after reading this post. Enjoy! I've been blogging, on and off, for a few years now. I started out on Wordpress, with a blog that read more like a personal diary! But I was absolutely rubbish at keeping it updated, and always felt I was letting my readers down. (Readers? Ha! What readers?! I didn't really have readers back then...) A few years ago, after giving up on the personal diary type blog, I started up a review blog, again on Wordpress. I loved it, but I still felt I hadn't found my niche, so to speak. Then, what I call the 'blogger movement' happened! Overnight, it seemed, bloggers were everywhere; on social media, on television, in magazines. Zoe Sugg, Alfie Deyes, Tanya Burr, to name a few. I started reading blogs, watching Youtube videos, and decided to start my own. I never, ever expected my blog to have more than a handful of readers. I never expected to love my blog, or blogging, as much as I do now. But I do! I never forget to post, I love planning and scheduling posts in advance, and I love the blogging community that I get to interact with every day! I've found my niche, as a lifestyle blogger, finally! 2. What advice would you give to bloggers starting out? Oh, for this question you should definitely check out this post which, I hope, gives an insight into blogging for those just starting out! But my best piece of advice would be, don't expect overnight success. Especially if you've started blogging because you've read about the Youtube stars. Blogging is actually a lot of hard work. It can take hours to complete one blog post, if you're serious about creating good quality content. You will pour blood, sweat, and tears into your blog and it's easy to feel frustrated when you see others in the spotlight, whilst you get a handful of views a day. But keep putting the effort in, interact with the blogging community and your readers, and you'll find that blogging gets more rewarding; even if it doesn't bring you overnight success! 3. What would be your dream campaign? Having struggled with mental health issues myself, I'd really love to support and promote campaigns that aim to break down the stigma surrounding mental health problems, and get people talking about MH. I've written a post about my struggles with telephonophobia, and will be writing a post about my struggles with anxiety soon, too. I hope my own posts help others be less ashamed or embarrassed, and give people who are struggling the opportunity to talk to someone who understands. Not really a plan, per se. I guess I just really want to keep going as I am; writing, what I hope are, good quality posts, gaining more followers and readers, and getting involved in the blogging community. Next year, I hope to attend at least one blogger event. I'm also planning to do a few more Youtube videos, after my last one proved quite popular! And I'd love to start working with companies and/or other bloggers on projects and collaborations for my blog, or theirs! Most of all, though, I plan to keep enjoying what I'm doing. Because once the enjoyment has gone, what else is there? I would like to nominate the following bloggers to do the Blogger Interview Tag, if they've not done so already, and anyone else who might like to do it! 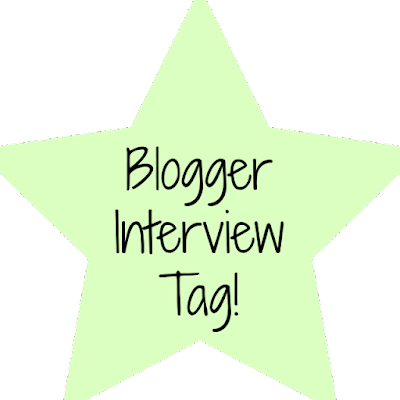 If you do your own Blogger Interview Tag post, please share it with me. You can connect with me in a comment, or on any of the social media accounts below! Awww lovely! I loved this post! Thanks so much for doing the tag! I really like your blog and you've been such an inspiration to me! Please do! Let me know if you do it - I'd love to read your responses!